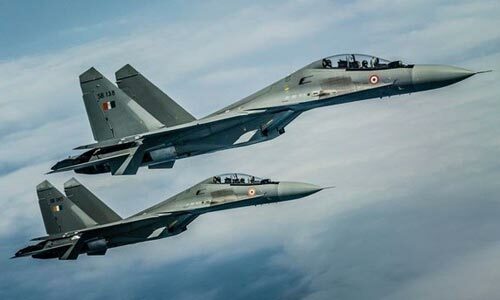 In last one week, the Indian Air Force’s (IAF) Su-30MKI has been deployed to test the Astra air-to-air beyond visual range missile and the Smart Anti-Airfield Weapon, to add to the heavy BrahMos air launched cruise missile which was tested earlier. Last week, India's Defense and Research Development Organisation (DRDO) flight tested the Smart Anti-Airfield Weapon (SAAW) from a Sukhoi-30 MKI aircraft of IAF. The trails were tracked by Radar and Telemetry ground stations at the Integrated Test Range (ITR) during the entire duration of the flight, an official press release said. Two weeks ago, the IAF test fired a beyond visual range (BVR) air-to-air missile Astra against an actual target in full operational configuration for the first time over Bay of Bengal. Two rounds of the missile from Sukhoi-30 MKI aircraft were targeting pilot-less target aircraft (PTA) Banshee, Defense officials were quoted by local media near the test range in Odhissa state. The mission was termed ‘successful’ considering the missed-distance calculation, though the missile failed to achieve a direct hit. In late June, the Sukhoi-30MKI fighter fitted with a Brahmos cruise missile was flight tested successfully. The aircraft was fitted with a dummy missile then to test its ability to carry such a heavy payload. Test of the Su-30MKI fitted with a live Brahmos cruise missile are planned sometime in 2017.